It was recently my pleasure to have been invited to attend the Pebble Beach Food & Wine 2013 (PBFW) event in Pebble Beach, California. Driscoll’s berry growers invited me to join a group of talented food and cocktail writers for a weekend of education that included Driscoll’s University “field to fork” learning event and the Pebble Beach Food & Wine 2013 Grand Tasting event with additional classes. 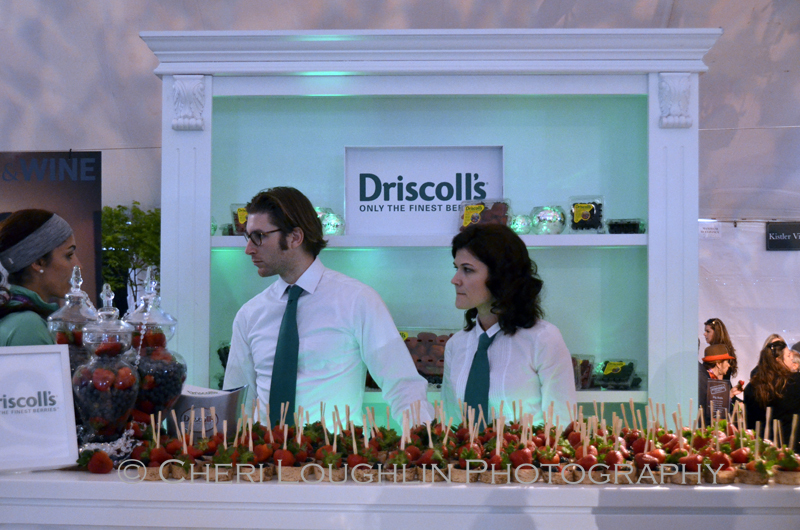 Driscoll’s was also a sponsor of the PBFW event. 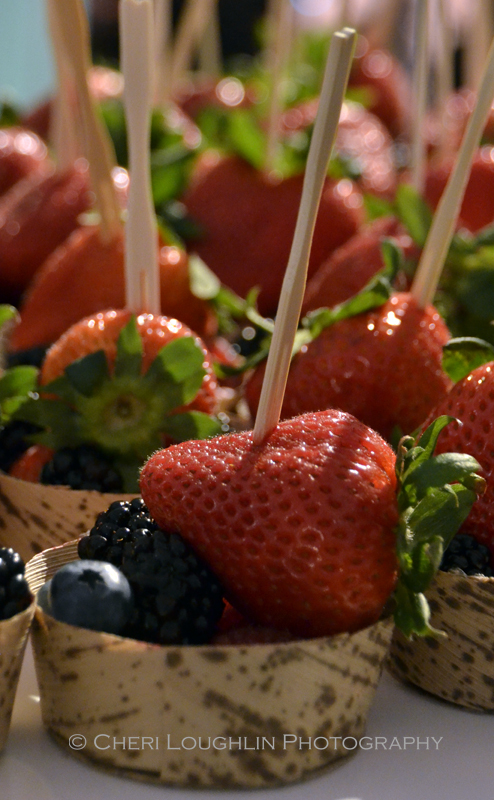 The Driscoll’s Lounge featured berry-licious foods with amazingly fresh berries as the centerpiece. There was even a fresh berry cocktail with non-alcoholic mocktail provided for those interested in a liquid treat that wasn’t of the wine variety. Stay tuned for future post detailing just how serious Driscoll’s is about providing you and me with the finest berries nature has to offer. 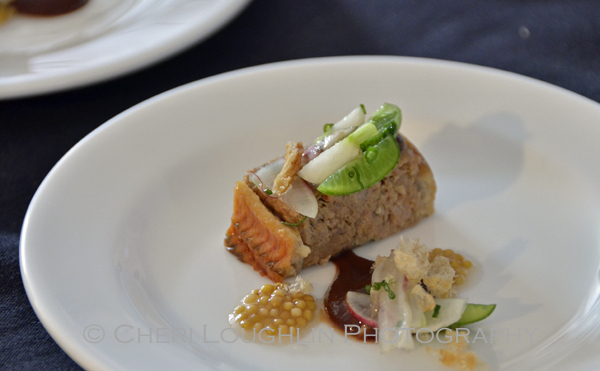 Two Peas and Their Pod has already written a post covering the Driscoll’s University tour and Pebble Beach Food & Wine 2013 tasting event through her eyes. Tess Masters of The Blender Girl created a wonderful fresh Strawberry Smoothie that everyone in our group raved about while on the Driscoll’s Tour. You might want to try it too. By the way, Tess is amazing! She and others will be writing about Driscoll’s and the Pebble Beach Food & Wine event soon, too. I’m not sure how Chef Jacques Torres had so much energy this far into the Pebble Beach Food & Wine event, but this is an amazingly generous and gregarious gentleman. Chef Torres entertained with his incredible smile and of course, plentiful chocolates. Though there was much to choose from and “Mr. 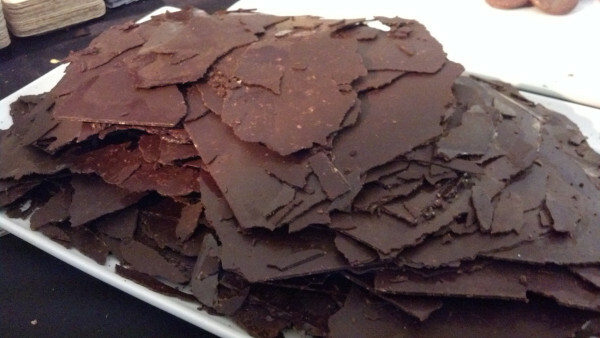 Chocolate” encouraged me to sample a little of everything, I chose the 60% dark chocolate sheets with crunchy potato chips layered in the chocolate. They were thin, crisp and melt in your mouth good. I took a quick look at Mr. Chocolate online and found some really cute Champagne Truffles (with real champagne) in the shape of champagne corks of course! I think they are a must have!! 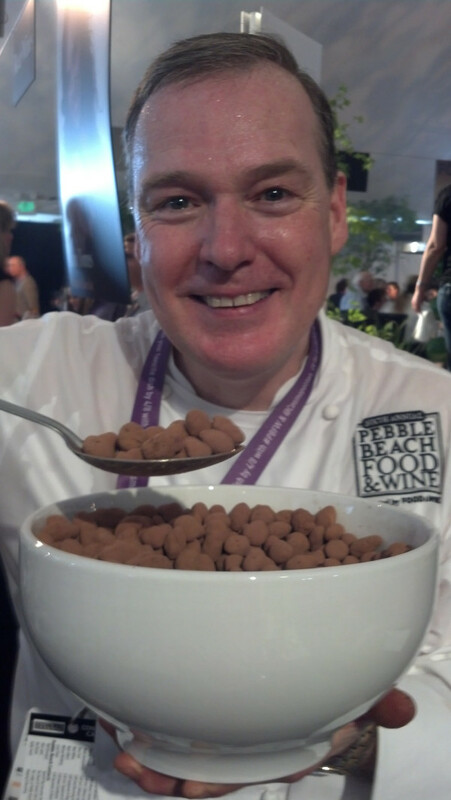 Be sure to keep up with Jacques Torres on Twitter (@JacquesTorres) and Facebook. 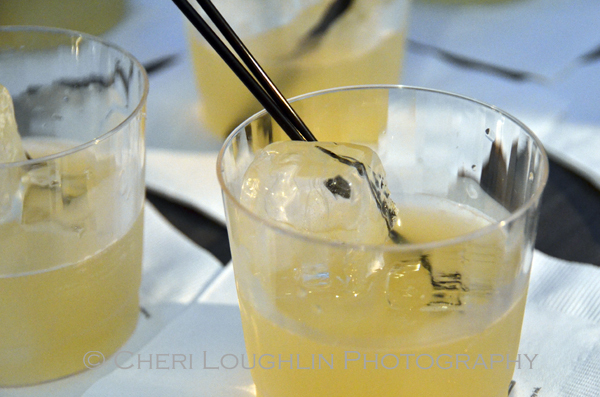 The Gold Rush Cocktail is a 3 ingredient drink consisting of bourbon, honey and lemon juice. The booth’s menu board said as much, but all I saw on the back table was Bushmill’s Irish Whiskey. So, I asked which bourbon was used in The Gold Rush cocktail. The bartender said it actually contained Bushmills Irish Whiskey and some sort of liqueur to mimic the flavor of bourbon. I’m wondering why the menu board said bourbon rather than Irish Whiskey? Aren’t we trying to educate consumers rather than keep people confused? Combine liquids in cocktail shaker with ice. Shake to blend. Strain into rocks glass over fresh ice. *Honey Syrup: 1 part Honey to 1/2 part Water – Mix honey with heated water. Stir. Allow to cool. Church & State Bistro rolled out their new summer 2012 cocktail menu last year which included a variation on the Gold Rush Cocktail called Elope containing Bushmills Irish Whiskey, cantaloupe, lemon and honey syrup. It is also served on the rocks. Find it and several other tasty sounding cocktails in the link provided. Another variation can be made with ginger liqueur served martini style found on the Two Tarts blog. 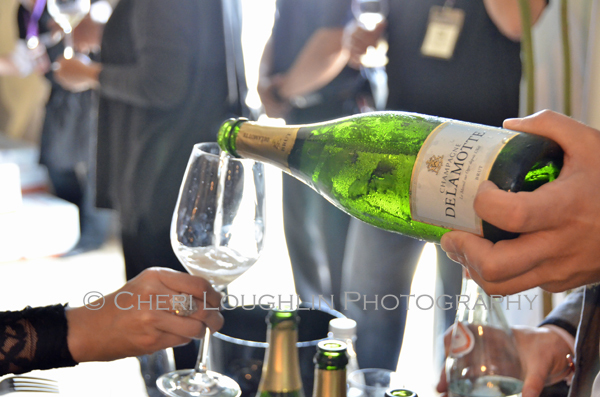 Champagne Delamotte Brut NV: 50% Chardonnay, 30% Pinot Noir, 20% Pinot Meunier. Can I just say I love champagne?! Bubbly in general. I think it’s just spectacular. 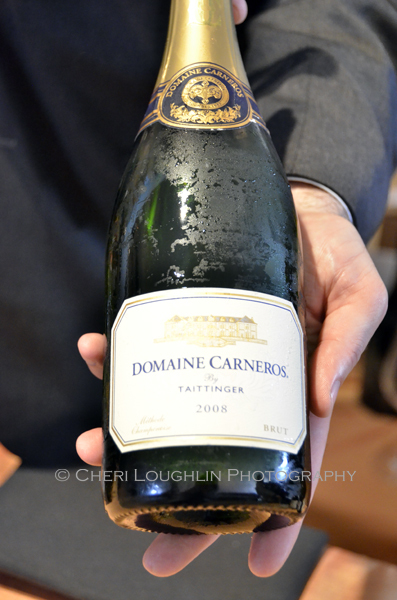 I sampled the Domaine Carneros Taittinger Brut 2008. It was quite busy in front of this particular sampling area, so I was fortunate just to get a taste and a photograph. Unfortunately I don’t have sampling notes. What I can say is that it was so delicious I really did want to go back for seconds or thirds even, but hardly thought that was the point in sampling a wide variety of spirits. I stuck to one sample only. Brut-style champagnes are traditionally comprised of chardonnay and pinot noir. 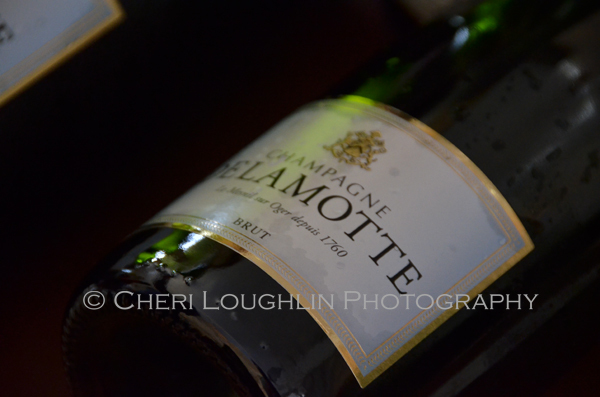 Brut refers to the level of sugar content in the wine. Domaine Carneros has received high acclaim through the years for its Brut Cuvée. It has been recognized for its consistent quality and affordable price. It has been described as having a mousse-like creamy texture, with hints of citrus, apple and pear with some sweet berry fruit. To be perfectly honest the label is what caught my eye and I’m glad it did. 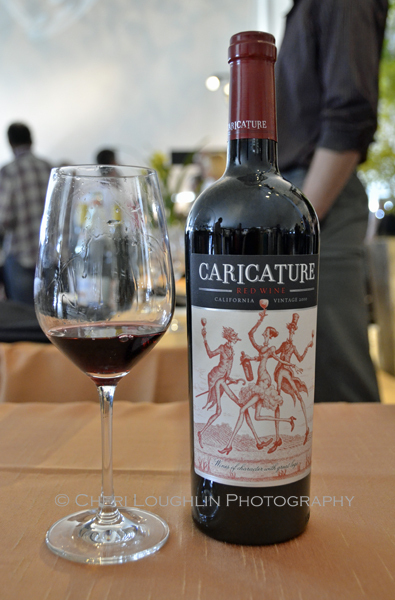 Caricature wine is indeed easy to sip just as it is described. It is an 84% Cabernet and 16% Zinfandel blend, estate grown by the LangeTwins Family. Certified sustainable. The wine is currently sold in Texas and California. It can also be purchased online for $15. Extremely reasonable! Ideal for everyday sipping and a perfect bottle to give as a hostess gift. 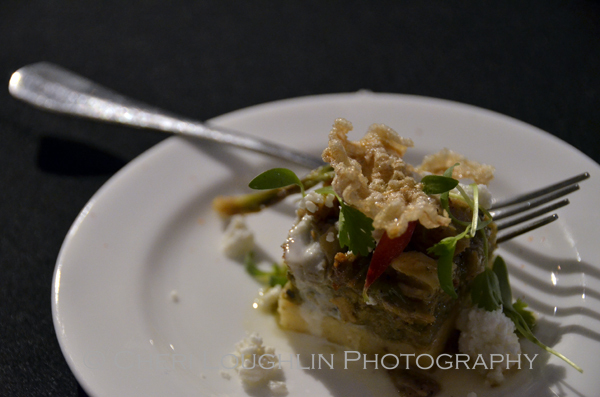 Nose to Tail Tamale by Chef Ray Garcia, Fig Restaurant, Santa Monica. Delicious! Spicy good! This scrumptious small bite could have easily become an entire meal with more bites of course. It was so good! Hypothesis Cabernet Sauvignon comes from the Roots Run Deep Winery. It is considered the FIRST wine of its kind due to a winemaking technique called flash détente or “instant relaxation.” This technique was created in Europe in the 1990s and introduced to the United States in 2009. It involves quickly heating and cooling the skins of the fruit before the fermentation process. This results in vibrant color, flavor and positive tannin extraction. This is a natural, organic process. In my opinion the taste results are incredible. 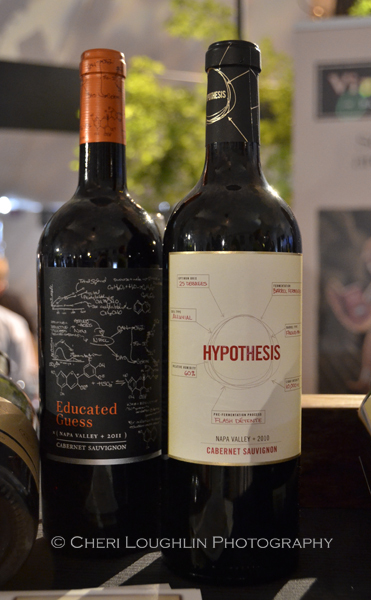 According to the presenter, Hypothesis Cabernet Sauvignon received 92 points from Wine Enthusiasts, December 2012. It is priced in the $35 range. The presentation was spectacular. 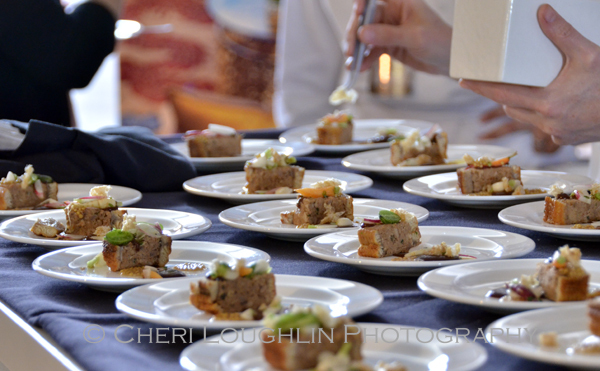 Who can resist rows of small plates flawlessly presented with foods we don’t usually whip up in the kitchen every day? Glazed eel?! I was of course intrigued. It was beautiful and delicious. 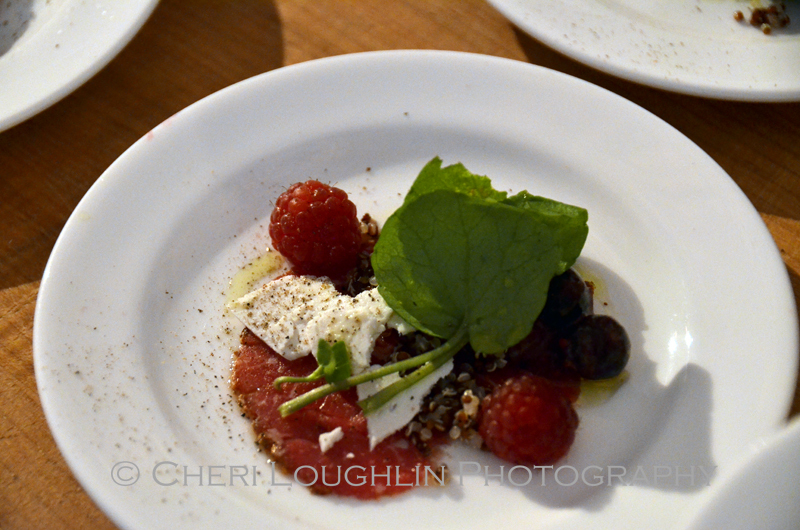 Chef Angie Berry created a lovely dish. I’ll admit one other thing here and now. I love food. I love savoring flavors. The best way I could describe this particular small dish is it tasted like an extremely extravagant tuna sandwich one would eat with a fork. Neither my tuna salad recipes or tuna sandwiches ever turn out so delectable, but the texture, pickling and tangy kick reminded me just a little of that familiar flavor. My apologies for a less than sophisticated description to this enchanting small dish.